We are very pleased to announce that we will be supporting top Australian rider Janine Jungfels in 2013. Janine is the highest ranked Australian rider in history and arguably the best female rider in the world at the moment. Following an injury in early 2012, she competed in her first World Cup in Antwerp, finishing in third place. She then went on to win the next two rounds, in Pra Loup and Geneva, making her the first Australian rider to win an international UCI event. Janine also finished in sixth place in the 2012 World Championships in Austria and is currently ranked eighth in the world. In the very short time that Janine has been on the international circuit she has significantly improved her riding and her results and has a very good chance of being World Champion in 2013. Janine, who is also supported by our Australian dealer Expressive Bikes, our Dutch dealer Ricco Bikes and Ride Mechanic, will be using a selection of our SL parts and will be competing in the UCI World Cup, European Championships and World Championships as well as the Australian national championship and national series. Head over to the riders page to check out her profile and media. 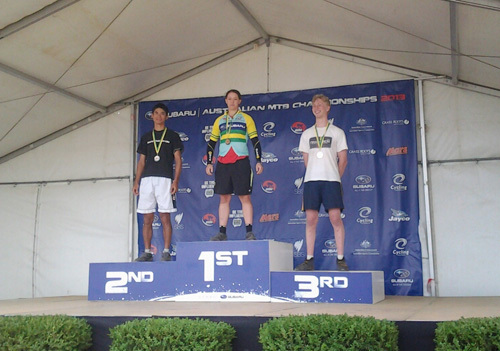 She is already off to a fantastic in 2013, finishing in first place on just 14 dabs in the Elite category in the Australian Nationals in Stromlo this weekend! For the full story and a short interview with Janine, check out the Expressive Bikes blog. Welcome to the team Janine!